So, yeah! I said yesterday this year was epic; let’s talk about that a little. This is the first year our daytime workshops are out of exile. We’ve been up in the tower, in Salon, a fine room with a lovely view but which is an elevator ride to somewhere nothing else is happening. Set to Discoverability Factor Zero, Mr. Wesley, and engage. Now we’re back downstairs, with the concerts. This is also the first year we announced livestreaming of concerts in advance. It was on short notice, because the technical details kept changing, but it was in advance. K built an uplink out of four parallel cellular devices – three LTE, one 4G – multiplexed into a single high-bandwidth channel spread across three entirely separate cellular networks. This was almost as good as a wired connection. This was also the first Electric Night. 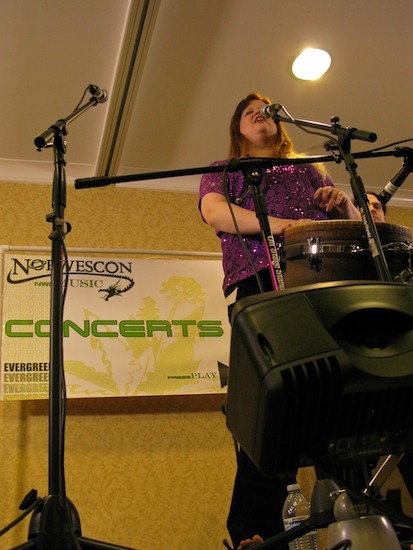 For a the first three years of nwcMUSIC at Norwescon, Thursday night was Experimental. This year, it became Electric, and we brought in atmospheric room lighting. Not a lot; just enough to paint the walls with colour. Mike Citrak – who I forgot to thank yesterday, I’m sorry Michael! 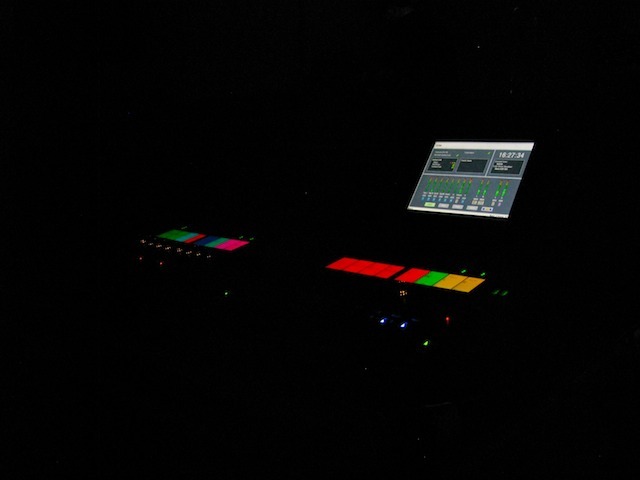 – also lent us some of his dance lights, which definitely helped. The Thursday bands loved it; we’ll need to do more of that. One of the funniest things from my point of view the entire convention was that – okay, opening ceremonies ran late, and we can’t start concerts ’till they’re done. Partly, because it’s not smart, some of them come over to us; second, because respect. So it’s totally cool. But I still had a crowd to keep entertained and energised, so I decided to screech them in, which is a thing we do at nwcMUSIC, stolen – in idea form, anyway – from screeching in on George Street in St. John’s. Only since we can’t serve whiskey, we do it with a literal screech. Now, 9K1 had already set a record for largest draw on a Thursday, and while Thursday is not exactly a huge day, they did really well. And most of their fans showed up on time. And I had all of them screech at the top of their lungs, all at once, with Opening Ceremonies right across the hall, and with all doors open. This was hilarious. Unintentionally, of course. I was just trying to keep my crowd in the room. I didn’t even know that I’d made an entire ceremony full of pros jump out of their chairs until a good five minutes later. We’d also yanked a bunch of chairs from stage front during setup, as a dance floor. Turns out: bonus points. Jonny Nero Action Hero was our only chiptunes act this year. 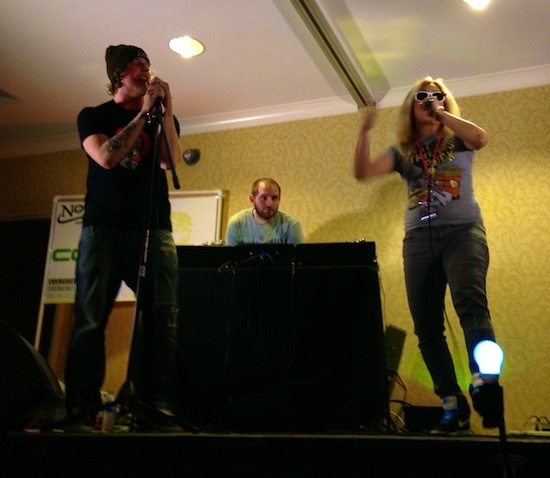 To be honest, chiptunes aren’t that popular at Norwescon, which is clearly a failing we’ll have to correct. But he drew a pretty respectable crowd too, and noticing that, we were starting to realise something was up. 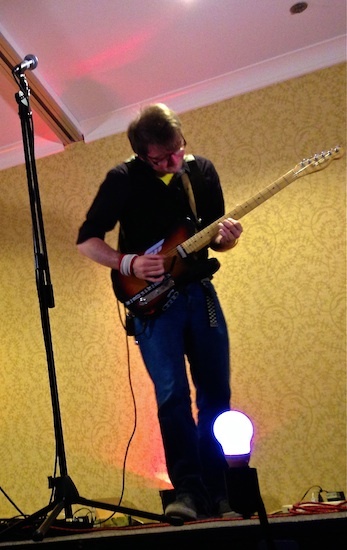 He’s also pretty good on guitar, and later, I’d find out, very good on panels. Oh, see the little light down on the bottom of the picture? There’re two of them. They’re my stupid little stage lights and I love them. I’d bought these colour-changing LED bulbs; I’d planned to put them in reflectors aimed at walls. Turned out they were too dim. I’d thought to put them in paper cones so we’d have colour-changing paper cones (critically different! to ordinary paper cones), but instead I stuck them on some snake-neck clamp lights clamped to the scaffolding. Once curled up in front of the stage? Suddenly they really kind of worked. Almost non-ironically worked, even. They’re like the idea of footlights even if you don’t really have footlights. I wasn’t actually on any panels either on Thursday or Friday, beyond my MC duties at all concerts. So I got a look at the art show and dealer’s room in the afternoon, and I have to say, both really interested me this year. I didn’t have the chance to give the art show the time it deserved, but whoever had the animatronic sculptures in back? Well done, artist, well done. Those were cool. I bought more things in the dealer’s room than usual, because there were more kinds of things than usual. Good show all around. Next up: The Big Show! With The Heather Dale Band. This is our daytime “event” show – we don’t do it every year – in Grand Ballroom 3. Grand 3 is a huge but freakish room where wifi will fail from device to device in the same room, so you can just guess what that did to our wireless. Still, we got a good capture, and were streaming live most of the show. And the rebroadcast after was perfect. You can push buttons on it or its touchscreen or a remote tablet and all the actual, physical sliders will move around to different presets. It’s pretty damn awesome. (Stop hiding in the dark, Ben, it makes you hard to shoot. After that, it was all load-and-move back up to the Evergreens for Friday Filkfest’s main set of shows. I really have to hand it to John and Jen’s volunteer crew this year, they had that kit wrapped up and shifted like magic. Friday is Friday Filkfest because filk is the oldest form of geekmusic, going back to the 1950s, and deserves its place in the sun. Besides, I like their DIY/participatory culture attitude. They’re punk in that way – and in perhaps no other way, but that’s a pretty damn good way. The word “filk” came from a typo in an article – the author meant to write “science-fiction folk music” and that I is awfully close to that O on the keyboard, and hey, who has time to proofread, am I write? – and they ran with it en masse and instantly. And while I couldn’t attend it, I was told by multiple people that the What the Frak is Filk? / Filk 101 panel went over well, with good attendance – and a lot of new people. A lot of new people. A pattern is emerging, isn’t it? Oh hey, say Hello to the Future, Friday night’s leadoff. Hello, the Future! is Nicole Dieker’s band, and she is the only person in her band, but she was certainly not the only person in that room. Friday’s a busy Norwescon night, too, with a lot going on, but she drew ’em in. Up next: Vixy & Tony. I’d written up a concert description for them consisting entirely of the word “Chicken” repeated many times – yes, I stole the joke, I don’t care – with the phrase, “we can put anything we want here, we know you’ll come” two-thirds of the way through. I was, of course, correct. But that’s not exactly an amazing mystical prediction, it’s just plain obvious. The funny part is, I’d originally scheduled them as the closer/headline act, with Seanan McGuire (who was also an official Norwescon Guest of Honour) in front of them. But they asked me to switch the two, expecting all of Seanan’s many fans as a writer to show up, and then flood back out as soon as she was off stage. I understand that, and of course agreed, but think their fears were unwarranted. Which isn’t to say that Seanan didn’t draw quite the crowd herself – she did, almost as many as Vixy & Tony. 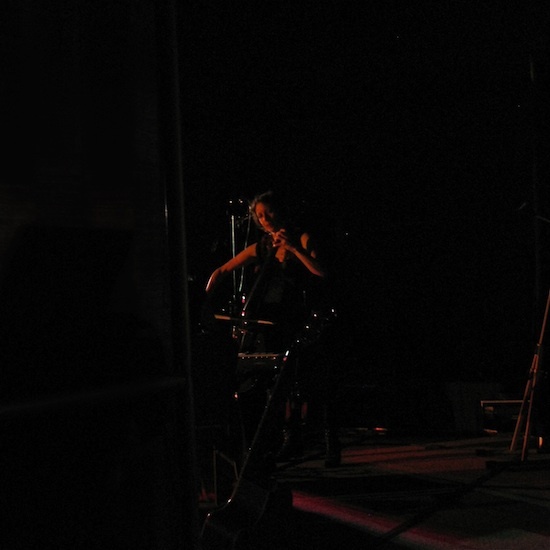 She’s had several albums out and has won several awards from the Filk community, and people were really thrilled to see her do a show. 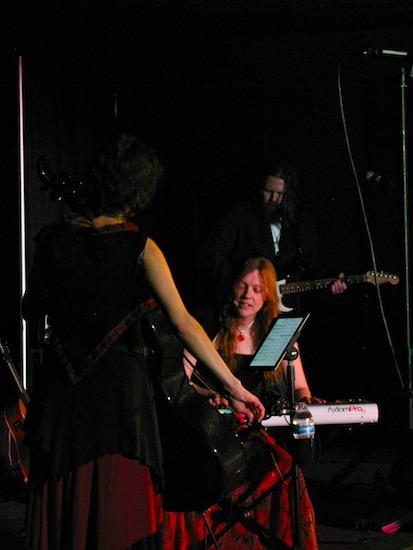 …and having a Totally Different Band made up of Totally Different Vixy & Tony – as they said on stage at the time – probably didn’t hurt anything either. …but I’m getting ahead of myself, and this is long enough already. The final part – Part Three, with lots more pictures! – will appear tomorrow. I’d like to see the replies, but when I click on the “n replies” link, it takes me to this page, where only m<n replies show. M being 0 on this post, and 4 on yesterday's, whereas n is 1 today and 10 yesterday. Any idea what's up with that? …Anyway. 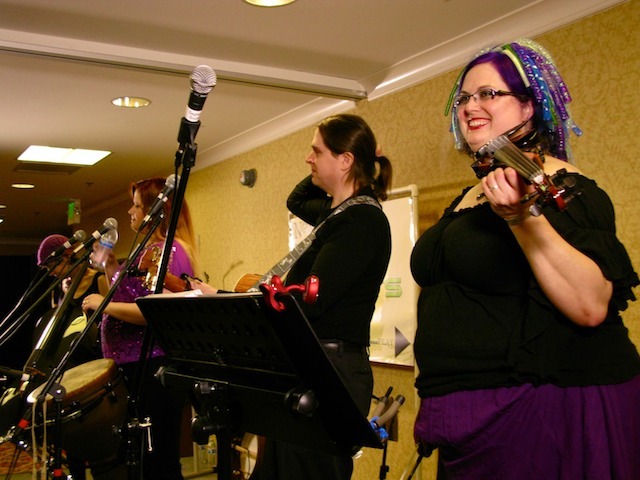 You have totally changed Norwescon music by bringing in more than Filk (although I would say it all falls under the definition of Filk, some of it just being found Filk rather than originally self-identified Filk. But anyway, you've brought in new stuff, and a level of determination and enthusiasm and professionalism that was rare in before-your-leadership years at NWC. It's pretty amazing to see, really. Thank you! 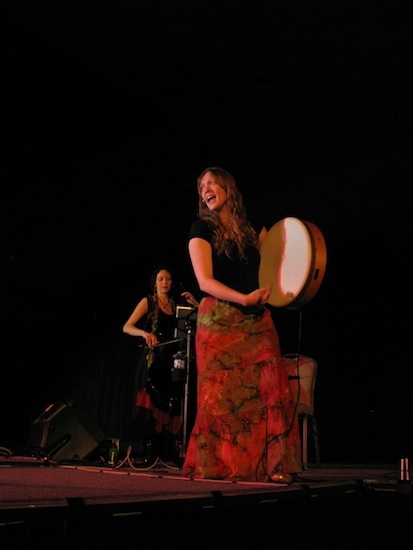 I'm curious, did the actual Filk circles ever reach critical mass and really get going on any night? I had to leave before it even got started on Friday – that's a downside to concerts running so late 🙁 – and Saturday, I stayed for a while but there were only half a dozen people in the circle tops while I was there. 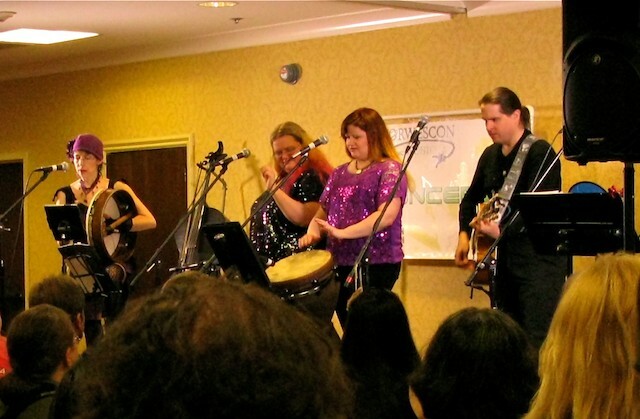 Concerts are great, but I really, really miss the actual Filk circles, which used to be the "big event" music-wise at cons. I have a feeling that because the concerts are (1) running so late and (2) using up so much of our performers' energy, they're killing the actual filking. Which makes me very sad. Concerts are, as I said, great, but they don't create the sense of community that circles do, and would never, on their own, have drawn me in and kept me in that community. Plus,I can hear most of the concert music by playing my CD's, but I can't hear much of the missing unrecorded circle music that way. I came into this community through Norwescon filk circles, and it used to be a circle big enough to span a pair of evergreen rooms running energetically until 3 or 4 or 7am both Friday and Saturday nights, easily. I know we had an unusual number of really popular concert performers this year. But I've seen this trend the past few years as well. 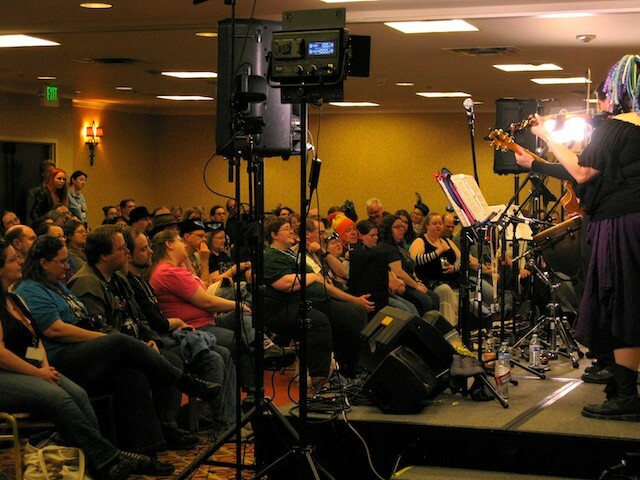 Next year, do you think it would be possible to make an effort to get the Filk circles up and running at full volume again (maybe at least ONE night)? Hopefully without actually taking too much away from the concerts? Concerts have often started much earlier in the day, for example, so if you made a point to run the concerts earlier on Saturday, then maybe the circle could get started a couple hours earlier. It might also help if you could manage to get a few popular singers to commit to at least an hour or two in the circle. Maybe instead of all of them having concerts, even. And advertise that. Just a couple ideas, anyway. What you're doing is fantastic! I'd just like to see the circle back as well. I’m not entirely fond of that, but my options are limited. See, I link to replies on Dreamwidth and Livejournal, but I actively I _pull replies from Facebook and Twitter back to here_. But I can’t easily separate Likes and Reblogs/Reposts from actual typed comments on those services; they’re all classified as the same comment type (“meta”) in the API. 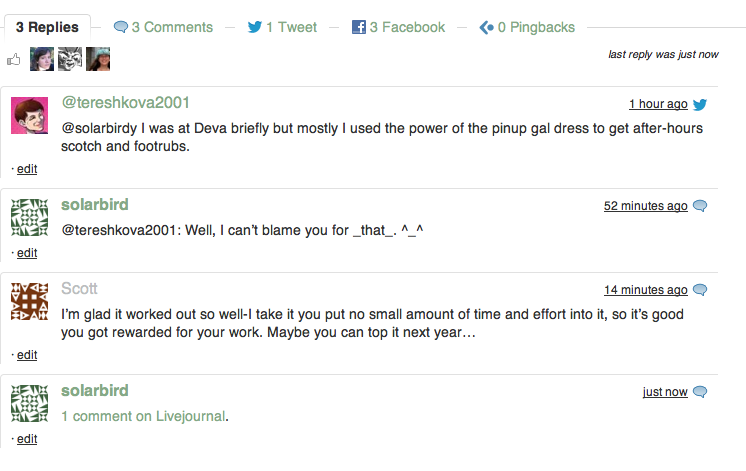 Now, I _can_ separate replies made in WordPress from all comment types made on those services. That’s pretty easy. And I could use that number. But that’s really misleading too, and in a worse way, because 90% of my comments are through other services. So – and this is an actual example – I’d have a post with 30 typed-text replies – and zero showing in the blog view. So nobody would click through to read, because they’d think nothing was there. Plus, the blog would look all deserted, when it’s not. So I use the other number, and label it as “notes” – at least Tumblr users know what that is, so it’s not completely from space – and let it include all comment types _and_ likes and reblogs. At least things don’t look dead that way. It’s an imperfect solution, but it’s the best I’ve managed so far. Fixing it is difficult, too – I’d pretty much have to write a whole new custom php interface to the comment system to do better. I’ll answer the filkcircle question in a separate comment since this is so long already. Under Beth Runnerwolf, Norwescon Filk built a strong and robust filk programme. It was _great_. Then she left to start Conflikt, and… kind of took most of those people with her. Not just personnel; mindset and attendance. 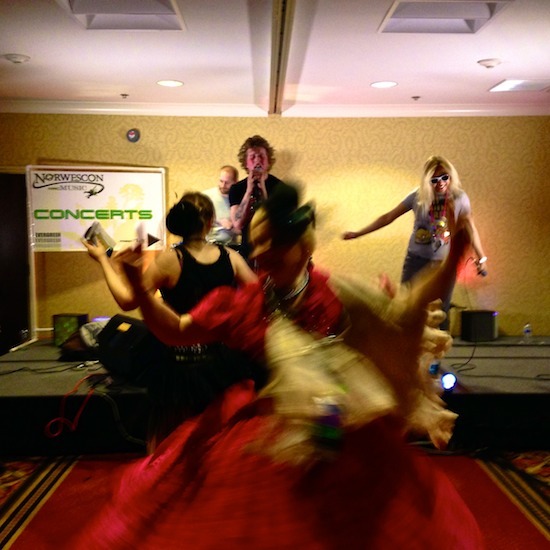 I’ve been told by Conflikt concom members that some of their members have _told them_ they didn’t see a reason to go to Norwescon anymore, now that they have Conflikt – but they are now again anyway, because of what I’m doing, _because it’s something different_, which is awesome. Believe me when I say I have nothing against Beth or Conflikt; I think it’s great! And I think she made the right call to set out on her own. I think if we were six months apart rather than two, we’d have less of this problem, but that’s not something either of us can fix. It’s like Norwescon and Sakuracon, but to a smaller degree. 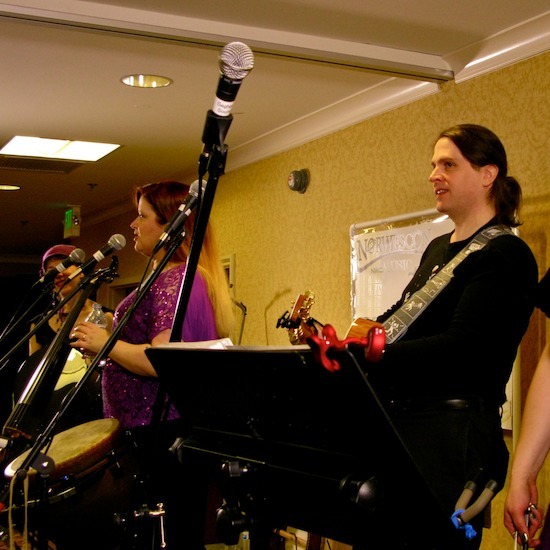 So by the time I started nwcMUSIC, there wasn’t a lot of filkcircle left at Norwescon again. And part of that is _still_ the proximity to Conflikt. But you’re _quite right_ in that part of it is _also_ the late start. To address that directly: there is really no moving the concerts earlier. I’m going to talk about some of the issues and problems first, and there are many. Please don’t feel like I’m trying to bludgeon you on this; I’m just trying to show the problems involved. I’m _entirely sympathetic_ and _do_ have ideas, which I’ll get to _after_ the problem list. We can’t start earlier on Thursday, because we can’t run against Opening Ceremonies. We could move to the afternoon, but afternoon shows on Thursday would draw approximately nobody. We could in theory end earlier on Friday, with our extant 7pm start. But that would mean losing a stage for Friday Filkfest. Filkfest is the day I _most_ want to be able to schedule what I call Filk Qua Filk: purely amateur filk enthusiast performers – people like Creede Lambert, who I have scheduled multiple times – and give them the _same treatment everyone else gets_, because _that is how we roll_. I don’t want to lose that. Because of reasons, I didn’t get to schedule that this year, and I’d like to improve that next year. Saturday, sadly, just isn’t much better. We used to start earlier, in fact. I used to have a Saturday 7pm show. And at 7pm we drew about 7 people. It was terrible, because 7pm puts us head to head against Masquerade, and that is a monster I will not try to fight. Plus, most people are still eating at 7pm anyway. …and if we did that and were very aggressive, that _might_ mean getting open circle filk started _one_ hour later, at 10pm. And that might help, now, but … we’ve actually started earlier, in the past, and it was no better. Things may’ve changed now that we’ve won back some mindshare, but at the time – at nwcMUSIC 1 and 2 – 10pm open filk was a ghost town. So that’s what I’m facing here. I want to crack this nut, but it is _difficult_. This has also got quite long, so I’ll move to ideas and solutions we’ve been trying in the next comment. So. We have a Filkcircle Problem. I like filkcircles; I love the participatory culture of it; I like the DIY; I want them to succeed. 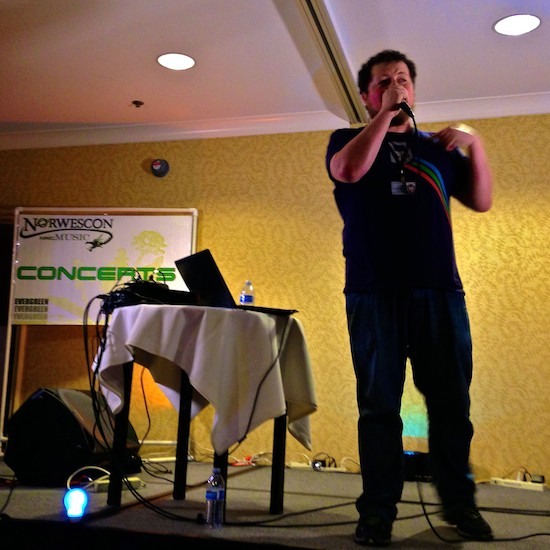 I also would like a _cypher_ at Norwescon, which is the nerdcore/hiphop equivalent of an open filk. I’ll talk about that in tomorrow’s post, in fact, because the Sunday panel “Cyper vs. Housefilk: FIGHT!” was an unexpected joy. It really was. One thing we did last year, and _wanted_ to do this year but couldn’t make work because of logistics, is what we’ve been calling Introduction to Participatory Geekmusic: A Learning Filkcircle. It’s how I managed to wedge a daytime filkcircle onto the schedule: I made it into a workshop. It _really is_ a lightly-moderated filkcircle. If there is any way in hell to do it, it will be back on the schedule next year. If Mickey – or someone else who could’ve run it – had been available Thursday afternoon, it would’ve been a sucky time, but I’d’ve scheduled it _then_. But we didn’t have anyone. Last year, we nailed it. This year, we had a The Big Show, and simply couldn’t make it work. Next year… we’ll find a way if at all we can. It’s popular, people like it, we like it, everybody wins. It doesn’t help the overnight situation, but it helps the overall situation. This year, on Saturday, a small set of filkers who weren’t interested in Molly Lewis set up in the sitting lounge between Evergreen and Cascade, at around 10pm, and hung out there all night. I tried to get them to hop over to Evergreen once that started, but they were happy where they were, and didn’t. …_except_, and this is a _big_ except, the location issue. Where they were last night has stairs on all sides. There’s no mobility way to get to it, so we simply can’t schedule it there. Similarly, we can’t schedule the the Shuttle Bay, which would also be great were it accessible, but it’s not. Outside _those_ areas, we start getting into _real_ difficulties. None of the Cascade rooms are allowed to make that much noise, so we can’t go there. I’ve been toying with the idea of something in registration area, which is kind of close to dance, but the noise isn’t _too_ bad… but it’s still not good, and it’s pretty crowded. Still, I’m going to poke at it. Rotunda is used for gaming and given that I _just_ got back out of exile – via them deciding they wanted Salon and Maxi’s – I’m not about to compete with them on that. Olympic 1 is back into sleeping areas, and out for the same reasons the Cascades are off limits. I tried working out something with the hotel to use some space in the bar for an Irish Session. It would’ve fit well, they’d’ve been able to sell alcohol, it could’ve been great for all sides – but the OH HELL TO THE NO was pretty resounding, so that’s not going anywhere. I’ve been toying in my brain with the Glass Hall interconnects between wings 5a and 5b. I’m pretty sure that’s not happening for a list of reasons (including noise – this time from parties – and fire safety issues) but I’m toying with it. It’s very difficult to reach, but at least it’s _there_. I’ve also tried encouraging the filklist on an idea they had to have a Filk Suite out in the party wing. I was so beyond for that it wasn’t even funny. It didn’t materialise, but I would _love_ to see somebody give that a go. I would give them all the non-monetary support I can through nwcMUSIC (which isn’t me being stingy; I don’t have a budget) _and_ throw in some dosh personally. But I can’t run it; I don’t have the time. It is a damned tough nut to crack. Next year, at least, the daytime event will be back if in any way possible. So that, at least, is something. More than that… yeah. I just don’t know how yet. But I am _thinking_. Jennifer Kilmer liked this on Facebook. Thanks, Dara. I totally appreciate all the scheduling conflicts, and all the other stuff that makes it so difficult to get circles to happen. I’ve seen informal filk circles happen in ways at other cons, too, like that one, that exclude some people who would really appreciate being able to find them, while meanwhile those people are at the official circle space wondering where the heck everybody is. I wish people would be more inclusive when these things happen. Orycon, for example, one year had an issue with something in the room that needed fixing. We were told we’d have the room back in an hour. So we went to dinner. Came back, and 99% of the filkers never came back to that room. Found out later that while we were at dinner, they’d gone off to somebody’s room and filked there all night. They could have come back when they knew the room was available, OR they could have at least sent someone back to post a sign so that others could find them. You know? An afternoon circle again is a good idea. I was thinking it might work well to have some circle time in between concerts, too. Then maybe we could take advantage of the people who are drawn in for the concerts. The only glitch there is chair setup. Concert equipment could stay set up between concerts as long as the music track is using the room during that time, right? Maybe we could come up with a way to set up chairs that would transition very quickly to something workable for open filking and then back to a concert layout (multiple times, if need be). Well, keep trying. I hope that one way or another, we get SOME kind of circle energy happening next year, more than we did this year, at least. And meanwhile, the concerts this year (and I’m sure the programming, which i didn’t catch much of, but not because I wouldn’t have liked to — just couldn’t be everywhere at once) really were terrific! Replies: I don’t actually see “notes”. I see “Replies”, “Comments”, “Tweets”, “Facebook”, and “Pingbacks”, each with their own number. You’re probably right that I’m not missing any actual responses, though. But for example, right now I see listed “5 Replies”, and I see 5 replies here. This afternoon, though, I saw “1 Reply”, but there were no replies I could actually see. I also still see “5 Comments” and “3 Facebook”, and those links just lead right back to this page and don’t show anything new. But I’m assuming that “Replies”, specifically, is supposed to refer to things posted directly to this page, and as such, I’d expect to see the number listed, like I do right now. Make sense? On replies: oh, okay, I thought you were talking about from the whole-blog view ( http://crimeandtheforcesofevil.com/blog ) which has “notes” clearly laid out. The notes breakout you’re talking about is part of the Social plugin and I haven’t played with it much other than installing it. But here’s an example of how the numbers get weird. That picture shows, clearly, four comments/replies. But the display says three “replies,” three “comments,” one “Tweet,” and some Facebook numbers. That’s because nothing done via twitter is a “comment” or “reply” even when they totally are. Facebook-based replies do similar things. The interleaved concert/filk thing utterly won’t work; it takes a circle 30 minutes or so to really get started, and that’s _not_ counting all the time involved in moving the chairs (and back!) which adds another 20 minutes on either side, so you’re looking at over an hour(!) of transition each time, so a three hour concert block, to get, say, an hour of filk between each one, would be seven hours long, and… yeah. Plus, as you mention; changing gears like that means everybody leaves, and they don’t come back. “Orycon, for example, one year had an issue with something in the room that needed fixing. We were told we’d have the room back in an hour. So we went to dinner. 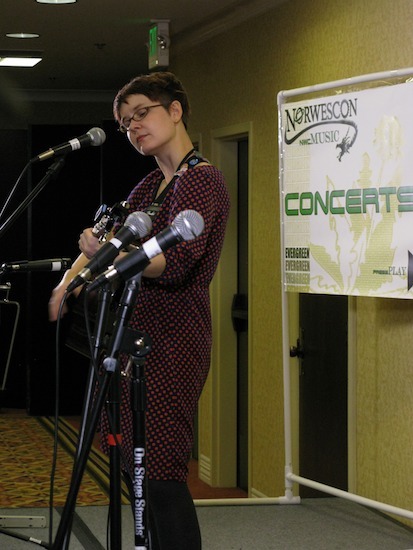 Came back, and 99% of the filkers never came back to that room.” We wouldn’t be any different at nwcMUSIC and Norwescon, I don’t think. The temporary ramp idea is interesting. I’ll poke around at that. There may be liability issues, but maybe not, too. That would let us make the Shuttle Bay useful again.